Crocheting is a popular hobby that both young and old enjoy. A favorite crocheted item is slippers, since they can be worn by almost anyone. Perfect for keeping your tootsies warm on those cold winter nights or to give away as gifts, easy-to-make crochet slippers are simple enough for even beginners. Click here for the printable slipper pattern. These super cozy slippers are easy to crochet for the beginning stitcher. As long as you can work in rounds, increase and decrease rows, and add new colors, you can finish these without a problem. Crocheting these slippers from the toe up makes them faster to work than most slipper patterns. This pattern is for women's medium size slippers, though you can increase the size easily by adding rounds to the sole portion. If you need help downloading the instructions, check out these helpful tips. Check your gauge: 14 sts and 14 rows in single crochet makes a 4-inch square. Don't cast off, just keep working in same rounds. Don't cast off. Chain 12, skip 12 stitches for heel opening, then join with slip stitch. Round 1- Chain 2, 1 double crochet stitch in each stitch around, join with slip stitch and cast off. Switch to bulky yarn. Join medium weight yarn with slip stitch to any stitch in the heel opening. Sew opening closed, weave in all ends. Sew large button to side of ankle. Repeat pattern to create matching slipper. There are many styles of crocheted slippers that are easy to make. From ballet style slippers to animal prints, there is sure to be a design that will be perfect for everyone in your family. These Mary Jane slippers from Crochet Designs by Kathleen are perfect for girls and women. A cute moccasin style slipper from Sue's Crochet and Knitting offers instructions and tips for adjusting the size. Instructions for other great slipper styles from the same website include an ankle high boot type slipper and crocheted sneaker slippers complete with laces. Ballet style slippers in a beautiful open mesh design are perfect for any aspiring ballerina. Ravelry offers an adorable free pattern for poodle slippers. Instructions for zebra slippers from My Zoo look wild in black and white. Turn Granny Squares into warm slippers in just a couple of hours. Bootie slippers are extra easy to crochet. A great looking slipper that any man would love to have to warm his feet are these high topped stripped sock slippers. Make them in his favorite color combination for a special gift. There are many excellent websites that offer crochet patterns, instructions and tips for easy to make slippers. Some of these informative resources are free while others charge a fee for their patterns. 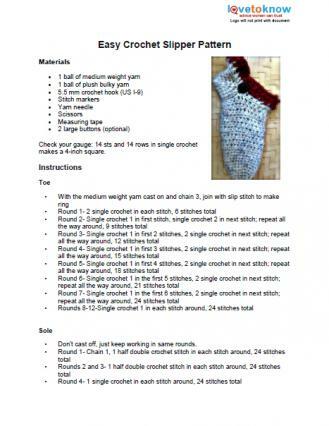 Sue's Crochet and Knitting: This site offers a number of different slipper patterns with pictures as well as patterns to make other items such as socks, purses and dishcloths. Crochet Pattern Central: Choose from over fifty different slipper patterns for men, women and children. Some are easy and some are more suitable for advanced crocheters. The Daily Crocheter: You will find a number of different free sock and slipper patterns on this site as well as helpful hints, a supply directory and links to other crochet projects. Frugal Knitting House offers several excellent books on crocheting slippers, many of which feature quick and easy designs. 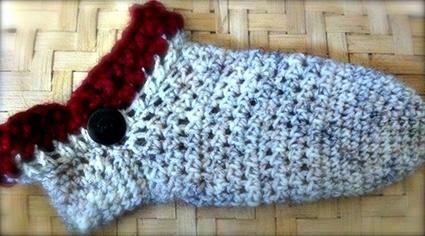 Many cute crocheted slipper patterns are available from Etsy for a small fee. An example of these adorable patterns include these unique Fox Slippers. Crocheting is a relaxing way to spend time and is something that anyone can learn. There is a great sense of accomplishment when you discover how easy it is to make a cozy pair of slippers. If you are new to crocheting, be patient, it gets easier with practice.